New: For use with the VecAdapt, Joystick Add-On for Atari and Commodore compatible joysticks. 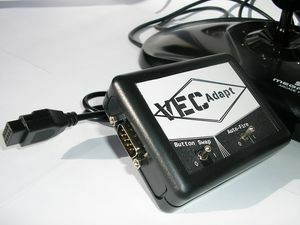 Usage is as simple as plugging a Mega Drive / Genesis controller into the VecAdapt, then the lead from the VecAdapt into one of your Vectrex's controller ports. No batteries are required, and the "Auto-Fire" and "Button Swap" functions can be turned on/off during play by moving the labeled switches Right or Left respectively. 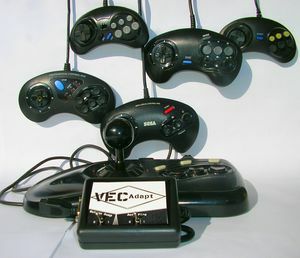 Third Party Mega Drive / Genesis controllers are also compatible, along with the Sega "Arcade Power Stick" controllers such as the one pictured. Note that the Sega wireless controllers have not been tested, and are hence not recommended for use. Don't forget to check out our custom-programmed Vectrex Cartridges.